When you think of children and tea, does your mind immediately go to a tea party with tiny cups and a frilly teapot? While I'm a fan of adorable tea sets and could endlessly play tea party with my kids, I've enjoyed introducing them to what tea drinking actually is. When we share tea together we not only talk about the type of tea, the flavors we taste, but also where the tea originated, and how it was made. --Tea allows children to get comfortable with interesting flavors, which will inspire them to keep trying new ones. My daughter now enjoys smelling and tasting new teas, and describing the flavors to me. It's a fun activity and it develops her palate. She's an adventurous eater and tea drinker. There isn't anything she won't try. The encouragement to try new flavors has opened her mind up to new things. --Tea nurtures mindfulness: when we drink we observe the tea, consider how it tastes, and think about where it came from. This in turn helps children become more aware as they sip. I hope this type of observation and mindfulness will slowly start to permeate other parts of their day. --Tea promotes patience: Waiting for the water to boil and watching the tea as it steeps helps little ones realize everything takes time, and cannot be rushed. The water also must cool a bit before they can drink it. --Tea expands the little tea drinker's knowledge of different areas and cultures of the world, where tea is grown, what cultures drink tea. We can look at a map together, see different parts of the world and understand how far away they are. How different cultures drink tea in different ways. --Tea is an alternative to sugary drinks- rooibos and fruit/herb blends are good choices for kids. They are interesting, have no sugar, and can stimulate conversation. As they get older they can move onto pure teas, and hopefully have less interest in soda and other sugary beverages. --Tea promotes and understanding of crop to cup- Children can learn how tea is picked, processed, and sent to a store. All of the people that may be involved in the process and how much effort went into one little cup. --Tea carves out one-on-one time for the caregiver and child. A few moments to enjoy time being spent together. 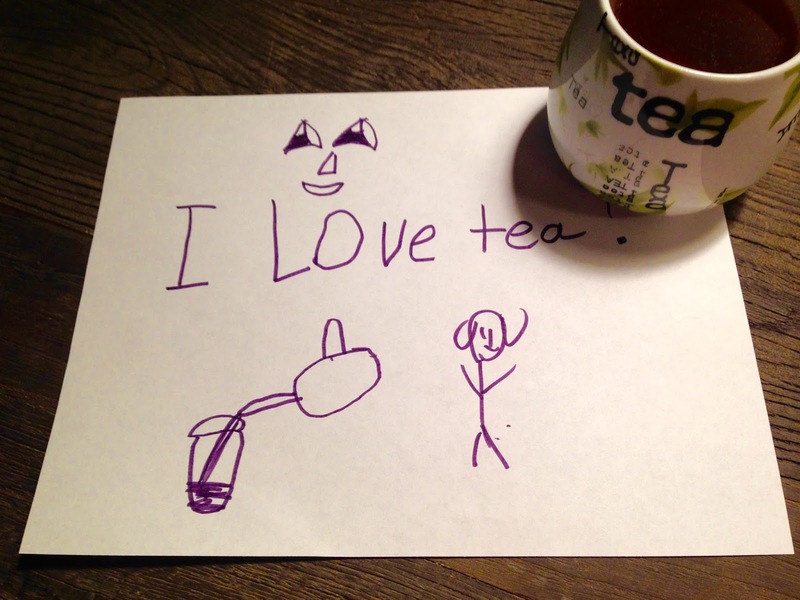 Taking tea with my children is a way to bring tea happiness, and share something I love with my family.